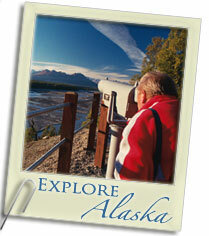 This section tells the story of the miners in the Wrangell-St. Elias region during the Gold Rush of 1898. 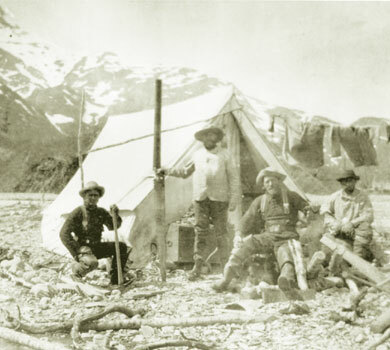 A century ago, gold miners lived in tents like this one at the end of the Klutina Glacier. They got there by dragging their goods over dangerous ice fields in relays. Jaunty and excited by their new adventure at first, many of the miners enjoyed posing for the camera in their new "rustic" gear. 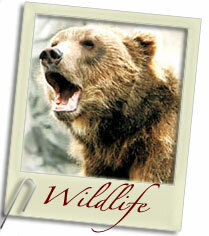 Although some were familiar with roughing it, others were from cities and small towns and were clueless of the dangers. After looking around fruitlessly in the sandy Copper Valley bottomlands, they eventually made gold strikes in the Wrangell Mountains, including at Nabesna. 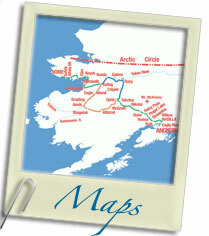 While gold was being found in Nome and other parts of Alaska, almost none was in the Copper Valley. 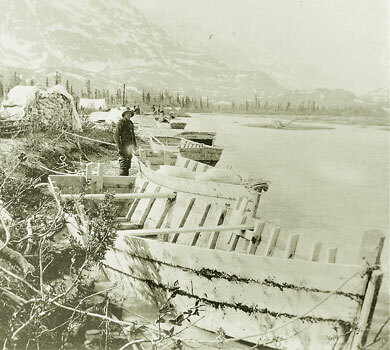 Many miners abandoned the provisions they had worked so hard to bring into the Copper Valley, and raced back over the Valdez Glacier to the coast, empty handed. 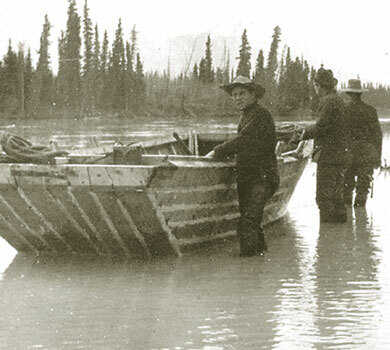 ...then loaded them with hundreds of pounds of goods, and watched them be destroyed in the Klutina River rapids. 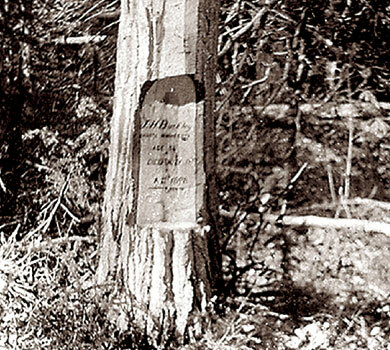 Jim Buckley, a Minnesota miner, drowned near the Gakona and Copper Rivers in 1898. You can see today the bluff from which he fell, downstream from the lookout at Mile 1 on the Tok Cutoff. The country's rivers were just one of the many dangers miners faced. 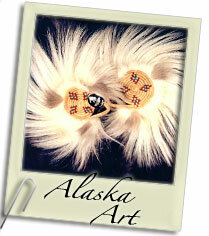 The Ahtna people were also affected by the miners' arrival. Out-of-control forest fires, accidentally set by miners, the flu and other diseases, and the loss of fish and game to hungry outsiders had strong impacts on an already rugged life. Gold in the Klondike drew the first miners into this region, by way of Valdez. 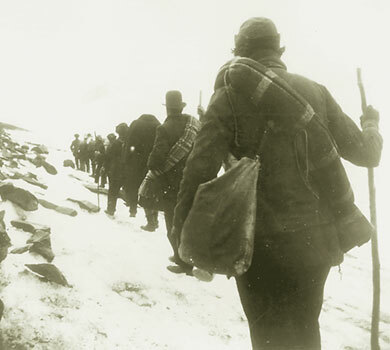 Struggling through difficult territory in order to avoid Canadian authorities, they entered the region over glaciers, dragging their goods with them. By 1900, miners had discovered and patented large copper deposits that local Athabascans had been using for centuries in what is now Kennicott. 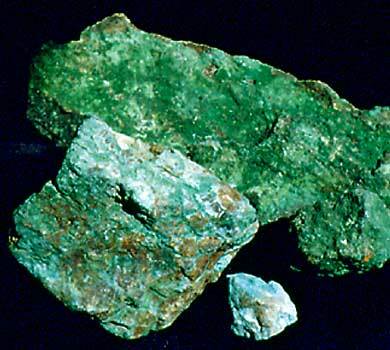 This is some of the green malachite and blue azurite found here -- both hydrated copper carbonates. 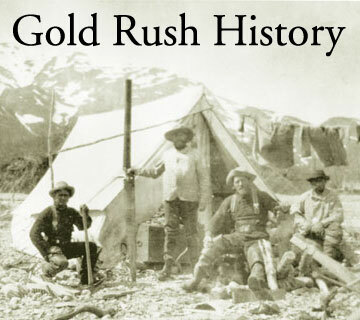 This fascinating collection of Gold Rush photographs dating from 1893 to 1916 is a must-see for anyone interested in Alaska history. Plus, if you like a photo, you can order prints. 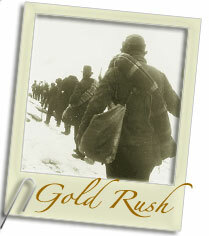 An educational site on the Alaska gold rush. Don't be put off by the tone, which is sometimes patronizing: even if you're not studying the Gold Rush in a classroom, there's a lot of valuable information to be found in this "Gold Lode." Especially of interest are the Image Archives, which include letters, time tables, poems, wedding anouncements, and photographs of various Gold Rush artifacts.